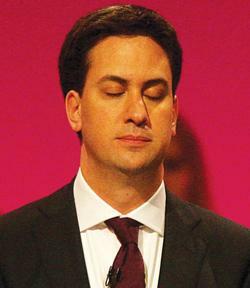 New Labour leader Ed Miliband does not believe in God, he said yesterday. Mr Miliband had previously said his religious views were a “private matter”, and his declaration yesterday means two of the three leaders of major British political parties are self-proclaimed atheists. Deputy Prime Minister Nick Clegg also confirmed he does not believe shortly after being named Liberal Democrat leader, while David Cameron last year said religious faith was “part of who I am” but admitted he did not go to church regularly. The Labour leader’s atheism puts him in stark contrast to his predecessors Tony Blair and Gordon Brown, for whom religion was a central part of their lives. The Labour leader replied: “I don’t believe in God personally, but I have great respect for those people who do. Mr Miliband and brother David are of Jewish descent, but religion did not play a large part in their upbringing by their Marxist father Ralph Miliband. David has said publicly he is an atheist, and was the target of some criticism for sending his son to a Church of England school. Despite spin doctor Alastair Campbell’s famous comment to reporters that “we don’t do God”, Mr Blair has confirmed since leaving power that his religious faith was “hugely important” to his premiership. He said he did not speak publicly about his belief while in office out of fear voters would think him a “nutter”. While more private about his personal religious beliefs, Mr Brown left no doubt of the importance of his father’s work as a Church of Scotland minister in shaping his view of life and his political values. Meanwhile, Mr Miliband declined an opportunity to propose to partner Justine Thornton on live television yesterday, but insisted that their unmarried relationship would not be an obstacle to him becoming prime minister. Mr Miliband said that he and Justine, 40, would get married “eventually”, but when ITV1 interviewer Kate Garraway suggested he should pop the question straight away, he responded: “I think it’s better to do it in person, really. He insisted that voters were “pretty relaxed” over whether or not politicians were married, and said that the important issue was whether a couple provided a stable home for their children. Mr Miliband admitted he was “really embarrassed” not to have signed his name on the birth certificate for the couple’s first child, Daniel – now 15 months old - and said he would make sure he does so when Ms Thornton gives birth to their second son, due in November.